At the end of “Maze Runner: The Scorch Trials” Thomas (Dylan O’Brien) and his friends from the maze, and new friends from the outside world, have been betrayed by Teresa (Kaya Scodelario). WCKD raids the rebel encampment and captures Minho (Ki Hong Lee) along with many other rebels. Several months later, a daring rescue of Minho is taking place as “Maze Runner: The Death Cure” opens. The rescue fails in it’s initial objective, to get Minho, but about 50 other Maze runners are set free to join Vince (Barry Pepper), the rebel leader, in the rebel alliance. 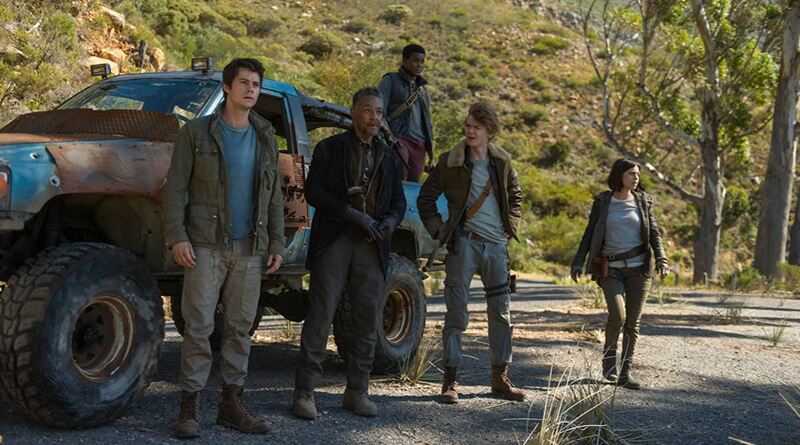 Not wanting to risk the lives of the other Maze runners, Thomas, Newt (Thomas Brodie-Sangster), and Frypan (Dexter Darden) head out to get Minho on their own. But, as they approach the last city, they run into a world of Crank trouble. And just as they are about to bite the dust……..out of the blue……Brenda (Rosa Salazar) and Jorge (Giancarlo Esposito) storm in, in their old truck, to save the day. Whew! What follows (and what preceded) is a palm sweating, action filled, dystopian adventure to save a friend from the evil forces of WCKD. Spoiler Alert (scroll with your mouse–>): Teresa finds out that the key to a cure for the Flare virus is Thomas…..but can she convince him to come back to WCKD? To find out how the Maze Runner trilogy ends, you will have to see the movie. It is fantastic! The best of the three.